Zingerman's Potato Chips for sale. Buy online at Zingerman's Mail Order. Gourmet Gifts. Food Gifts. 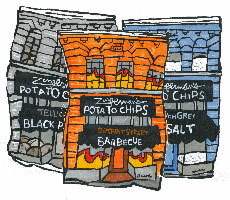 Technically, there's no "Z" on each one, but we're very pleased to announce Zingerman's own line of potato chips! We've partnered with Great Lakes Potato Chip company in Traverse City, Michigan to make the chips. We also got a lot of help sourcing the perfect spices for the chips from Montreal's Epices de Cru. Take it from me: superior spices paired with small batch potato chips are really, really good. French Grey Sea Salt is your classic chip topped with mineral rich, complex sea salt. For purists. Detroit Street Barbecue is more than just sweet, like mainstream chip barbecue brands. Complex, a little heat, you really taste the spices. Tellicherry Black Peppercorn features some of the world's most flavorful black pepper we could find (thanks, Epices de Cru!). With noticeable heat from the pepper, these are more for adults. Dill-icious Dill Pickle is briny and herby with plenty of dill pickle flavor. Each bag is personal sized, just right to go alongside a sandwich.